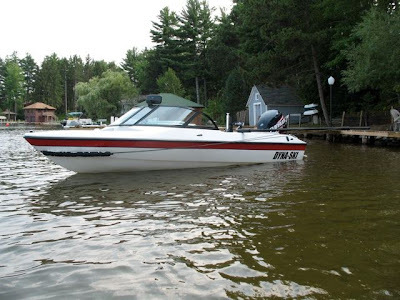 I have been getting more inquiries about using a boom on Dyna-Ski Boats as the supply of nice used outboard barefoot boats is drying up. 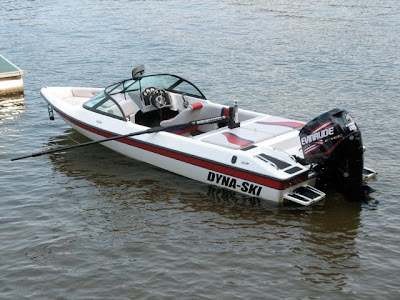 Dyna-Ski Boats does offer a front mounted pylon on two models of Dyna-Ski Boats. The 17.6 Open Bow and the 20' Open Bow Barefooter. The front mounted pylon allows the use of a straight barefoot boom. The front mounted pylon is not a popular option as Dyna-Ski buyers seem to prefer the open cockpit which the rear mounted pylon provides. Using a V-Drive Barefoot Boom from Barefoot International seems to be the best solution for a Dyna-Ski Boat. 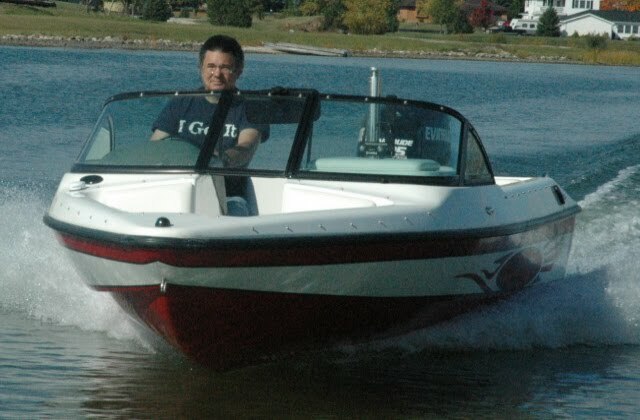 Dyna-Ski Boats is a Barefoot International dealer. 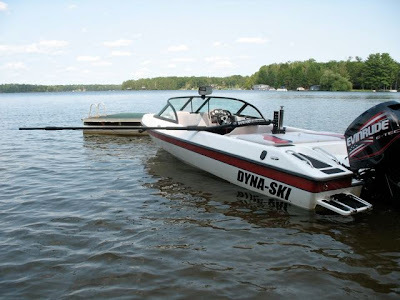 The pylon on the Dyna-Ski 20' Open is normally mounted in front of the sun deck so the pylon on this model is about 30" further forward than standard location on the 20' Open Bow Barefooter and 20' Closed Bow models. As you can see in the photo above the spray from the 17.6 Open Bow Dyna-Ski does not hit the skier even on a human tow extension. 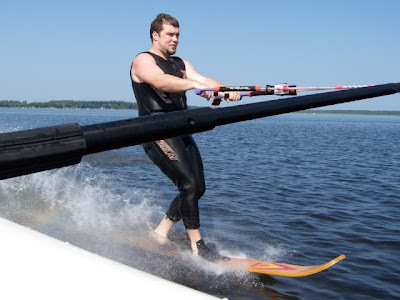 I would not suggest that you try this on your lake. These guys are skiers in a show ski club and lots of time and practice went into this demostration. If you want to quickly teach people to ski using the barefoot boom is an easy way to accomplish this. Dyna-Ski 20' Open Bow with a V-Drive Boom and height adjuster on the pylon. You can see below how the cables attach in the front of the boat. The open bow means you can do it easily. The picture below should give you an idea of where the skier is along side the Dyna-Ski Boat. 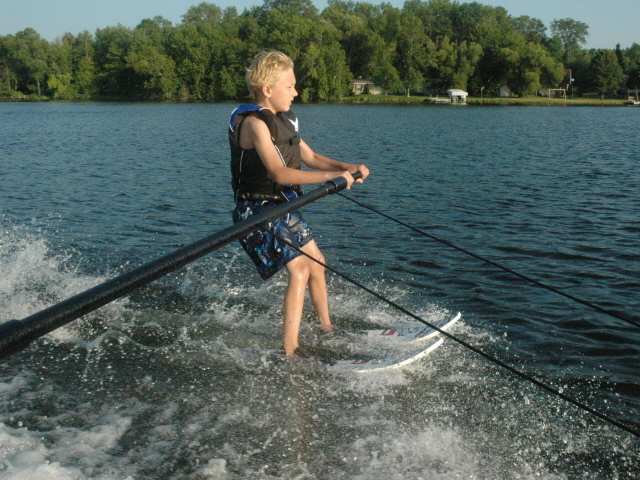 With an optional pylon mounted height adjuster the boom can be set at the right height for any skiers. If you have any suggestions for articles or pictures to contribute please send them to info@dyna-ski.com.